The actual playing of tennis becomes a sideshow in this gossipy profile of the women’s pro tour, from Sports Illustrated writer Wertheim. Years of uninspired play by “moonballing baseliners” on the women’s tennis tour was eclipsed, Wertheim posits, when a cohort of electrifying young players sent a considerable buzz through the circuit. Burning bright was Venus Williams, who took both the US Open and Wimbledon as well as both gold medals at the Sydney Olympics. And as an African-American, she and her enormously talented sister Selena blew fresh air through the musty precincts of the Women’s Tennis Association. Martina Hingis, Lindsay Davenport, and a host of newcomers were also playing numinous tennis, with Monica Seles and Jennifer Capriati making comebacks. Yet Wertheim is primarily concerned with the hype, the money, the glamour, and the dirt as he follows these players and others through the 2000 tour. (Which is a shame—when he lets his tennis writing peek through, such as in describing the US Open, it shines.) What we learn from these pages is that Hingis is “an Uzi of candor” who needs an image consultant; that Seles is “an unregenerate capitalist”; that Anna Kournikova “has a magnetic force field that can pull grown men out of their orbit”; the earthshaking news that women’s professional tennis has deplorable dads and a whole lot of bed-hopping; that the players are “sassy, brassy divas” who are “ready for the catwalk.” Of course, there are also the Williams sisters, tennis’s “urban legend,” but Wertheim lets “the tennis father from outer space,” Richard Williams (famed for “blowing smoke in all directions”), dominate the story. 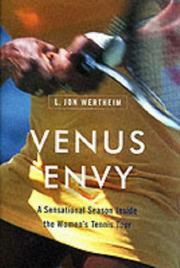 Unfortunately as well, Wertheim is given to snickering inanities such as “men’s tennis could use some Viagra,” not to mention the title. Long on the human-interest angle, trivial as a piece of tennis writing.